drome are under-diagnosed in clinical practice. and guarding in epigastrium (Figures 1 and 2). and at day two was zero. panniculitis was reported (Figure 3). phillic invasion of fat but no other pathology. force in 4 separate episodes. deemed to be of low risk to his life and of others. tions a diagnosis of Munchausen’s Syndrome was made. ing attention to themselves . tention or sympathy to themselves [6,7]. psychiat r ic hospital because of paran oid schizop hrenia. on her right low er leg. She denied any h istory of trauma. ing revealed a mass with edema in the right frontal lobe. was hospitalized again because the wound had reop ened. 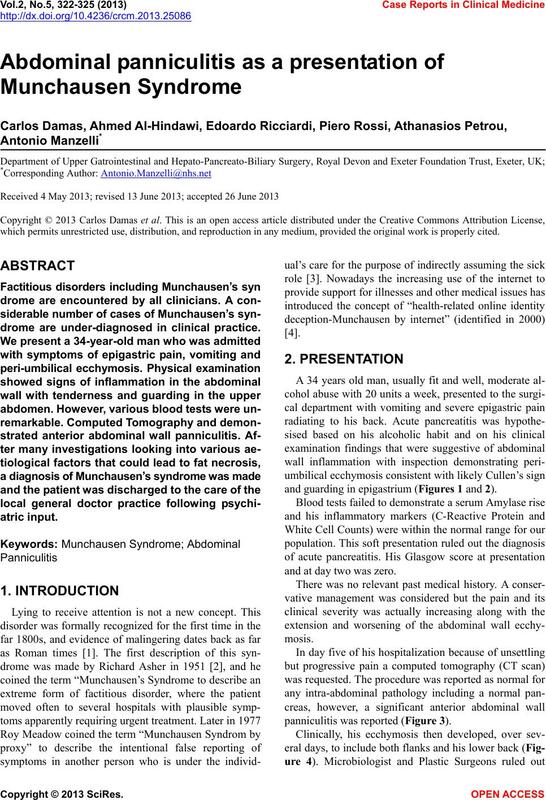 diagnosis of Munchausen Syndrome . of all patients with pancreatic disorders [17-19]. clinical presentation of our patient . tients who present with this picture. cal Internet Research, 14, e115. factitious disorders. Neurologic Clinics, 13, 267-281. Reports in Medicine, 2012, Article ID: 486421.
abscess and intraventricular hemorrhage: A case report. No Shinkei Geka, 39, 381-386.
acute pancreatitis. BMJ, 316, 1982. Butler, J. (2003) Serum amylase and acute pancreatitis. Emergency Medicine Journal, 20, 550-551.
amylase, isoamylase, and lipase in the acute abdomen. combination. 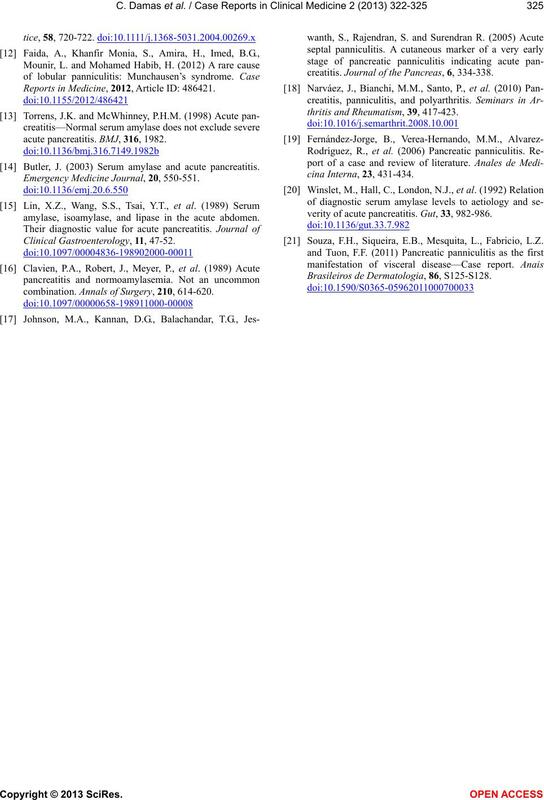 Annals of Surgery, 210, 614-620.
creatitis. 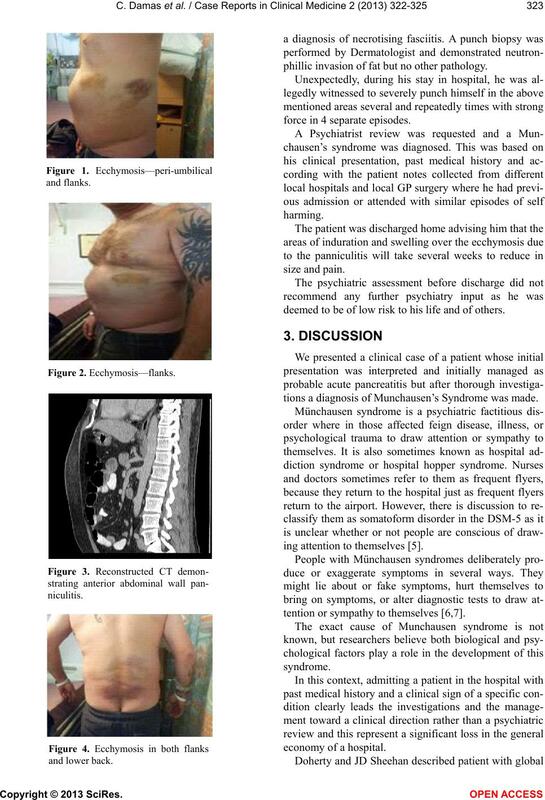 Journal of the Pancreas, 6, 334-338.
thritis and Rheumatism, 39, 417-423.
verity of acute pancreatitis. Gut , 33, 982-986. Souza, F.H., Siqueira, E.B., Mesquita, L., Fabricio, L.Z. Brasileiros de Dermatologia, 86, S125-S128.